Is it just me or does anyone else still have lots of cheap mis-matched bits of crockery lying around in leftover from their student days?! You know the ones - chipped lime green plates, dinner sets with only one dish remaining, and hand-me-down bowls complete with fetching beige patterns that your nan would love. When you're embarrassed to bring them out at a dinner party, its safe to say its probably time to replace them. I've been trying to step away from buying cheap, flimsy crockery I know I'll be replacing within a matter of months, and get some beautiful well-made pieces that will not only last, but will also suit whichever home/kitchen we end up in next. And it's nice to have some good-looking, grown-up bits isn't it? Step in the lovely people at Denby. They very kindly got in touch offering me a chance to review their new Studio Blue collection, which, as you can probably imagine, I jumped at the chance to do! 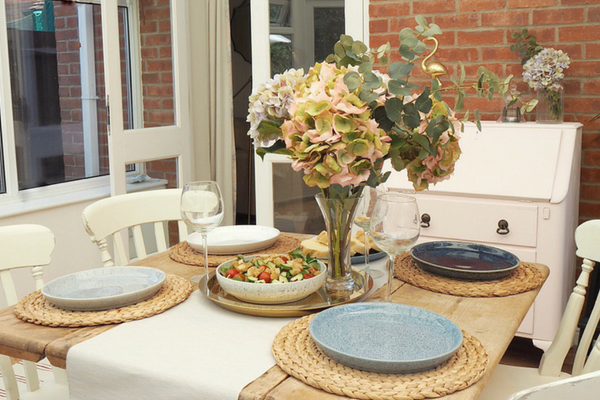 The collection is made up of stoneware pieces that come in beautiful mis-matched blue and white colours, and have a real seasonal feel to them, perfect for alfresco dining and summer lunches. I absolutely love this set of four plates, which feel so sturdy and not at all flimsy like some of the cheaper sets I've owned over the past. How cool are the mis-matched colours too? So summery! I took the opportunity to use the set when we had some family visit, and served a seasonal lunch. The nesting bowl is the perfect size to serve something like a salad, and I used this smaller oval tray for some bread, but it would also be perfect for things like dips or even to use as a side plate for more formal dinners. I'm definitely one for cutting corners when it comes to things like dinner sets - we don't hold too many dinner parties - but that doesn't mean there isn't a reason to update your crockery, and I'm so pleased with this Studio Blue set, as I think it updates our crockery nicely, being practical but also pretty enough to have out on display in your kitchen. You can have a look at the new Studio Blue collection here, and Denby's sister company Burleigh also have some lovely sets too - I've currently got my eye on their Rose Pink Felicity collection. Do you have lots of random pieces of crockery hand-me-downs cluttering up your cupboards too? I really love this set. The different shades of blue and white give it a really casual feel. I'm definitely with you on investing in grown up crockery. It's one of those things that makes you feel like a proper adult.